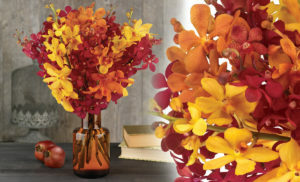 Brilliant fall colors can be found in an array of bouquets from Calyx Flowers. Fall has arrived and so have a great number of annual autumn traditions from apple picking to New York Fashion Week, where new trends and designs are showcased. In addition to trends and designs, fall ushers in a new palette of colors alongside cooler weather and crisp, vibrant leaves. We were excited to learn about a great fall tradition in which the color experts at Pantone honor the seasons with a seasonal fashion color report. For Fall 2016, Pantone wanted to honor autumnal attributes such as strength, confidence, and complexity, and has done so by anchoring their fall color palette with a wide variety of colors anchored with blue. This year’s fall palette coincides with some of our most popular flower colors, which falls in line with a new way to shop on our website, Shop by Color. We created this new category to more easily browse our collection of fresh fall flowers and find exactly what you’re looking for. As colors and flowers can convey powerful meanings and symbolism, shopping for flowers by color helps you deliver the right message, whatever it may be. Selecting flowers and plants when trying to fit a theme or color board for a wedding or any other event can be stressful, and by shopping by color, we hope to alleviate that while doing what we do best: delivering top-notch bouquets and arrangements for your gift giving or event needs. So without further ado, here is Pantone’s fall palette for 2016 in our favorite language: flowers! Blue is the backbone of Pantone’s Fall 2016 Color Report. The color blue is the anchor of the entire Pantone palette and evokes tranquility. Blue may seem unexpected in a fall palette yet works well as we enter this moody season. 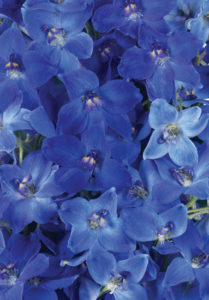 As diverse as the color itself, we have the right blue flowers for whatever you may want to send. From exotically dyed Stunning Sapphire orchids to light Blue Hydrangeas, we offer a range of colors within this family to exude elegance, serenity, and peace. 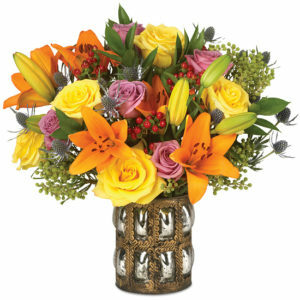 Light, buttery Crème de la Crème roses, perky yellow Gerbera daisies and other yellow flowers symbolize friendship and good health. In addition, nothing celebrates fall more than a beautiful bouquet of autumn colors with splashes of yellow. Perfect for sending a bouquet to brighten somebody’s day or a friendly hello, choose yellow flower bouquets for vibrant notes and cheer. We can’t think of a better color to portray passion than a romantic red. Bold yet warm, reds exemplify strength and courage, as well as adding a splash of punchy brightness to an otherwise more tranquil fall 2016 color palette. From light red roses to bright red berries, this dynamic color incites excitement in the very best ways as soon as any Calyx box is opened to reveal brilliant reds. The Casablanca Bouquet is a perfect example of using bright red berry accents and purple tones for a fashionable fall palette. Whether you choose hot pink and purple orchids or serene lavender Coolwater roses, purple evokes a sense of luxury and drama that is perfect for the fall weather. Perhaps an unconventional fall tone, purple is able to lend an exotic touch and a little extra creativity when gifting a bouquet. Our Van Gogh Irises are perfect for an artistically creative gift while our Casablanca bouquet with blue thistle and lavender roses was created with dreamers in mind. Fall is the time for sending warm messages of cheer to family, friends, or colleagues and finding the appropriate bouquet by color is a meaningful way to do so. And what better way than in the most fashionable fall colors? Select a color and fall in love with all that autumn has to offer!